Some of you might be interested in how the development process is coming along, so I thought I’d post some updates here now and then. Lately I’ve been focusing on getting the basics of game mechanics working — stats, technologies, leveling up, and all that stuff. Some of this work is a lot of creative fun, like coming up with new technologies, while some of it is about organizing how the server does its ‘bookkeeping’. That’s fun in its own way, too — figuring out how to do things elegantly and efficiently. 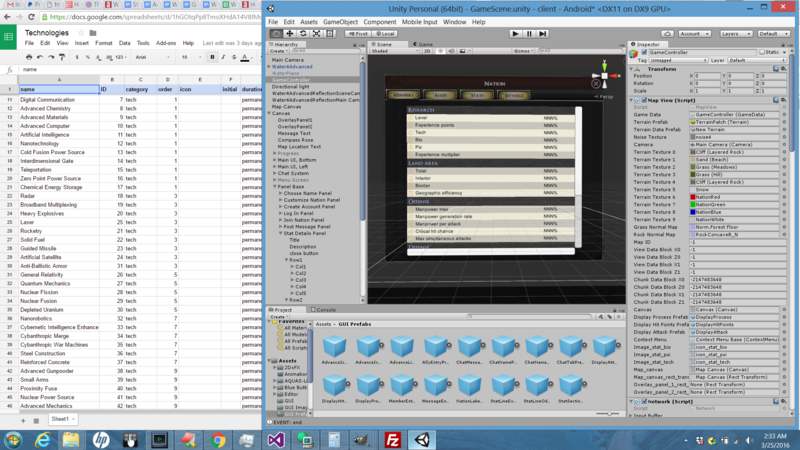 The screenshot shows the Unity window, zoomed in on the nation stats panel that’s still under construction. You can see a few stats that are new to this version of War of Conquest in there. In the background is part of the technologies spreadsheet.